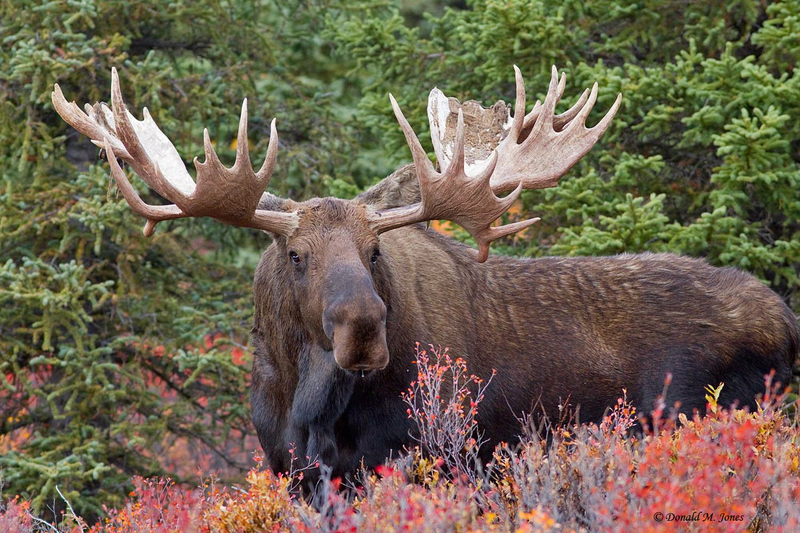 Moose is one of the largest hunting spices. Striking with its majestic figure, no doubt this is one of the most desirable trophy hunts by every avid hunter. That’s a hard hunt, which takes place in cold mountain latitudes and tundra. The moose is a grand animal, it can reach up to two meters high and width and exceeds over 500-600 kilos of average weight. His trophy crown leaves no one indifferent. In addition to the size, the thickness of the crown also matters for a great trophy elk addition. Stay with us to learn more about this mystical animal, its ways and hunting tactics to outsmart the buck and get it at gunpoint. Moose can be found in Sweden, Norway, Finland, Russia - both in its European part and in Siberia, and Kamchatka Peninsula - Alaska (USA) and Canada (Yukon and Northwest Territories, West and East of the country). Larger ones dominate Alaska and Yukon, while smaller mosses inhabit European territories. The moose spreads along the northern forests of Europe, Asia and Northern America, as well as in the mountains and tundra until the beginning of the Arctic Ice. Jumping straight from the Bering Sea that separates Asia from America where we reach the North American continent.Moose hunting season in Alaska starts towards the beginning of Septemberand lasts until the last week of the month. 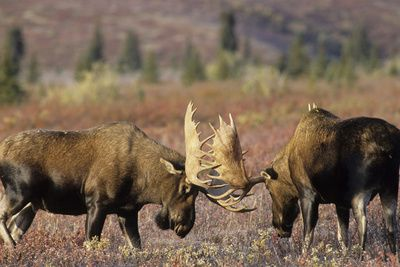 According to the Fish and Game Department, moose in Alaska have the largest antlers in North America. They can be found in places abundant with willow and birch shrubs, habitats alongside the Stikine River in Southeastern Alaska, the Colville River on the Arctic slope and other rivers in Southcentral and Interior Alaska. Allhunters must complete hunting education course before applying for a license, as there are special additional restrictions on the size of the animal that you are allowed to shoot at. After completing the course, the license application can be completed in person, by phone or via Internet. Different areas open in various time so additional information must be obtained in advance. Note that hunting moose in Alaska and Yukon is among the most legendary and hard hunting experiences that exists in the world! We talk about hunting on horseback riding, camping overnight on the shores of large lakes, river boat stalking, that sometimes can be combined with caribou, grizzly bearand wolf hunting. It is the ultimate expression of authentic hunting adventure; whose primary objective is the largest deer in the world. If you prefer guided moose hunts, we advise you to search for Alaska moose hunting trips, but for a first timer, better hire a professional moose hunting outfitter. How not to make mistakes between moose and Roosevelt or Rocky Mountain Elk? Absolutely every year, lots of hunters shoot moose, thinking they are aiming at Rocky Mountain Elk or Roosevelt Elk. Unfortunately, there is a solid fine of over $1000 and hunting license loss, if one accidently shoots a trophy moose. As we mentioned moose are the largest deer family members and occupy areas near willows and alongside streams and ponds. High numbers of both spices can be found in the higher woodlands across Alaska, where Roosevelt Elks are also thriving. No mistakes should be made between those two, as there are variety of differences that separates one bull spices from the other. Watch for size, color and antler shape! On prima vista these could be enough for you to be sure which one is peeking on the other side of you riffle scope. 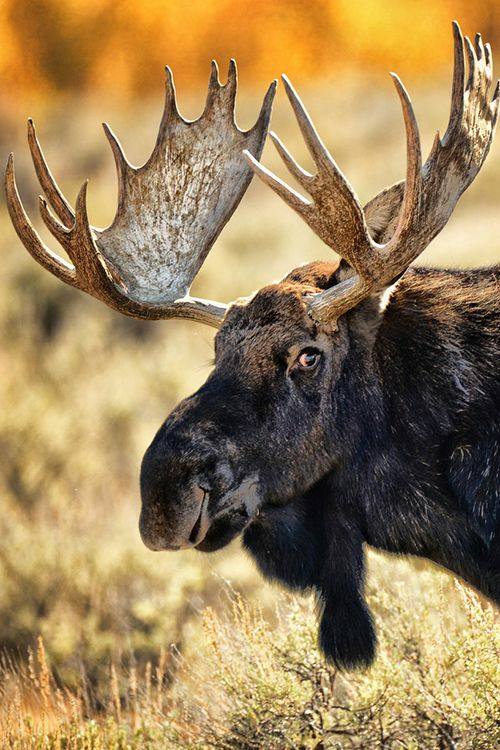 A mature bull moose easily weights twice as much in comparison with the average Elk – reaching the impressive 1200 pounds. Shades of light brown and golden grace the beautiful figure of Elk, while dark brown, towards black is the dominant color of the Moose. Its nose is quite large long and round, wearing a bell under his neck, while the Elk’s narrower, with no bell underneath. The range of the antlers is a grand difference between these big game animals. Broad flat crown decorates the moose’s head, unlike the pointy Elk’s antlers gracefully distinguishing him from the rest of the big bucks. Two of the most effective moose hunting tactics remained the same over the years – glassing and calling. Whichever hunting technique you decide to pursue, have in mind that the hunt is done very early and very late in the day, when the moose are most active. Study you quarry, gathering and feeding areas, habits and preservation tactics and moose call. Also, master yourself in recognizing the right antler size and don’t wait until the last minute to practice your shooting skills. This could be the adventure of a lifetime. This refers to selecting a hunting area near natural springs and swamps, rich in willow and birch, abundant in droppings, fresh tracks, beds, rubs and scent pits. Once you choose a good area, spot a place that exposes a good view for stalking, such as tree stands, edge lines and small swamp wooden bordering brushes. Pay attention to scent management, as these mighty creatures have well developed smell detecting senses. Therefore, finding a stalking place where the wind is blowing in your face is more likely to produce better results than the wind coming from behind your back, as it carries your scent in your prey’s direction. When moose glassing, gear up with quiet hunting clothes, good deer hunting rifle and reliable camo shirt and equipment, that will hide you well enough, as the animal is equipped with eyesight detecting predators from quarter of a mile away. Don’t lose faith. Pick a spot and use your binocular to look for movement or anything unusual. Rest only when to observe with your naked eye. Floating down a river is a lovely and more enjoyable approach at moose hunting. If you do it quietly and with the appropriate concentration, you’ll be able to spot the bull lunching willow, drinking or walking on a riverside trail. Moose create variety of different sounds that change according to the beginning and towards the end of the Fall hunting season, when they become generally noisier. 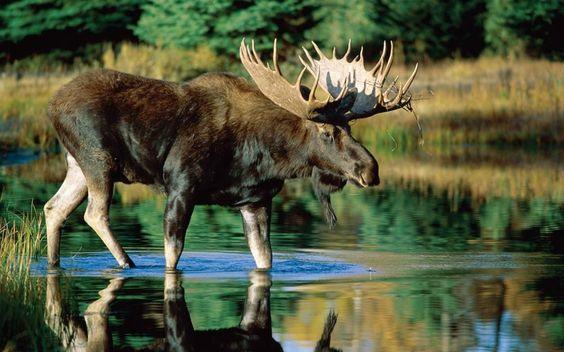 Bull moose calls differ from those of a cow, making short deep groans of one or two seconds with 2-3 second intervals. Cow’s grunts are longer with a higher pitch of 4 to 5 seconds and may last nearly a minute. A good addition to your hunting gear would be a megaphone, that hunters often use in number of circumstances like to attract the giant deer from afar. Bull challenge calls are practiced in mid-September. This is the time when mature moose become more aggressive as their level of testosterone significantly rises and their antlers harden. Then the call sound is more of a deep “mu-wah” issued 3 or 4 times, from deep in your belly. A bull without cows of his own is more likely to come to your call, thinking you may be a bull accompanied by females. A good portion of at least half an hour must be spent in repetitive callings as the bull may be attracted from over a quarter of a mile away. Later in the month, it’s turn for more melodic nasal calls that imitate cows, which has a great success rate for many stalkers every year. Finally, some last points that sum up a good plan for the hunt of a lifetime. Prepare yourself well in advance. The right hunting gear and provisions must have no mistake, as this is not your usual one-day ride, shoot one off and drive it home kind of affair. Too many first-time moose hunters underestimate the animal and the conditions, and often come back empty handed. Grab the right firearms, ammunition and moose calls. Provisions like sleeping bag, enough food, flashlights, matches, binoculars, compass, duct tape, durable tent, fully stocked first aid kit with iodine tabs, extra set of clothes, solar charger, sunscreen and camera. Some kind of fuel, portable cooking pot and water filter will go a long way when sometimes your moose hunting trips may prolong for more than 3-4, up to 6 days adventure. Before you endure on this memorable experience, make sure you pay a visit to your physician and inform him on you plans to vanquish in the mountains for indefinite number of days. This you can predict complications or possible health obstacles that can slow you down and end your trip sooner than you’ve thought. 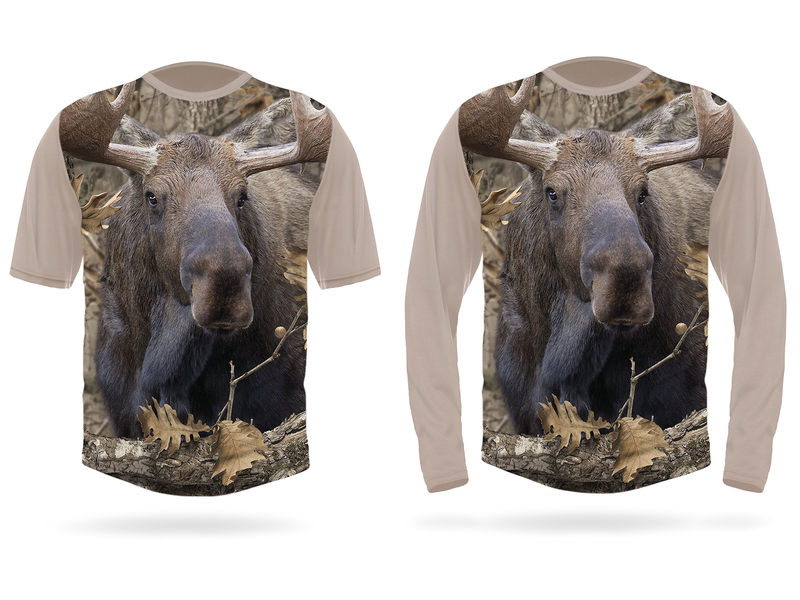 And for those obsessive big game hunting maniacs who want to show just much they really love and devote to this adrenaline chase, check out our awesome 3D Big Game Shirts. Turn your hunting passion into a lifestyle, reveal new levels of comfort and design with the highest-resolution-image ever printed on a t-shirt, featuring your favorite game animals and birds! Are you are looking for hunting gifts for men? Regardless of a birthday or Christmas event, Hillman T-shirt is the gift that gets you into that hunter's heart forever.